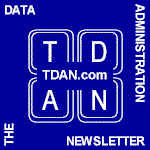 The Data Administration Newsletter website is a great source for articles about data and data administration. Go there, you won't regret it! See also SQL Standards and the Database Design Information page for more free papers. And Where do XML Tags Come From? Is SQL a Real Standard Anymore?